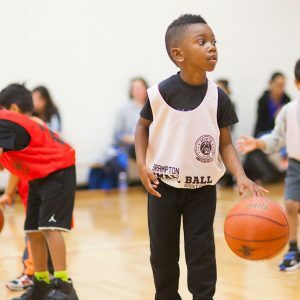 Our Jr. Small-Ball program provides an entry-level basketball program for children aged 5 to 7 through a fun, active and healthy learning environment. Jr. Small ball focuses on the fundamental movement skills of running, jumping, throwing, catching, balance, agility, and co-ordination. The program includes age-appropriate equipment (smaller basketball and lowered adjustable hoops) and modified games. It also introduces fundamental basketball skills such as dribbling, passing, shooting, rebounding and playing defence. The Jr. Small-Ball program runs on Saturdays. Your first program includes a BramptonBasketball reversible jersey, and awards for all players on the last day of the program. Basketballs, Uniforms, and reusable water bottles* are included with your registration fee. Players will need basketball/gym shoes and shorts to participate in the small ball program.